A screenshot of my session in Terminal. MARBL houses and owns the rights to the poet Turner Cassity’s papers, including born digital materials from one computer. Dorothy Waugh, my colleague on the Digital Archives team, processed the born digital materials and is now working to get them online and publicly available on an Omeka site. I am experimenting with text analysis of his born digital materials. So far, my experimentation has entailed using the Stanford Natural Language Processing group’s Named Entity Recognition software, following this tutorial by William Turkel. Over the past month or so, I have become somewhat comfortable on the command line from working with text analysis tools and generating network graph data via the command line. I started by working through bits of Prof Hacker’s Guide to the Command Line, at the suggestion of Sara Palmer, electronic text specialist at ECDS. Since then, I have mastered basic navigating among directories. “cd [name of directory]” and “ls” (which lists the files and directories within that directory) came to be easy. I also had a better time when I realized that you either have to navigate to the folder that has the stuff you’re working with, or else you have to include the file path within your command to make things work. I learned how to create and edit files within the command line, with vim. “Vim” plus the name of the new file will create and open a file within Terminal, then you hit “i” to “insert” text, “esc” to exit the edit mode, and “:wq” to save and quit. As with many of these sorts of things, internet searches are your friend when you get stuck. But when I ran the script, not all of the pdfs were converted to txt files. I realized that I had issues wherever the file names included spaces, because (I have learned) the command line can’t deal with file names with spaces in them. So, I deleted all of the text files that had been created by entering “rm *.txt”. (Note that “rm” is one of those commands you have to be extra careful with in the command line. If you delete something in the command line it won’t be recoverable.). Then I set out to fix the file names. I ran a command (which I found by googling) to replace any spaces in file names with an underscore. I ran the convertmyfiles.sh script again, and it worked. 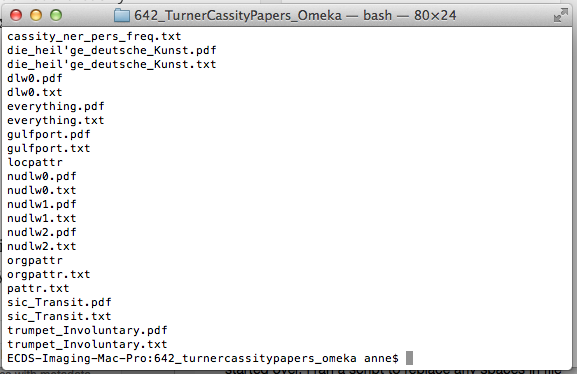 I checked that there was a .txt file for each .pdf by listing the files in the directory (ls). List of files in the directory. I opened the file to check that it had work. “Open” opens the text in an external text editor, but I can also open the file within the command line, with “vim everything.txt.” I also created a combined pdf, just for my own perusal, by installing pdftk and following this tutorial on how to join multiple pdfs. Once I had my everything.txt file, I turned to Turkel’s tutorial on using Stanford Natural Language Processing group’s Named Entity Recognizer (NER) software. I had to upgrade to the latest version of java–which then messed up Gephi (the network graph program I’m using for another project), which doesn’t work with newer versions of java. Using the command line, I had to edit the Gephi configuration file to point to an older version of java, but that is another story. 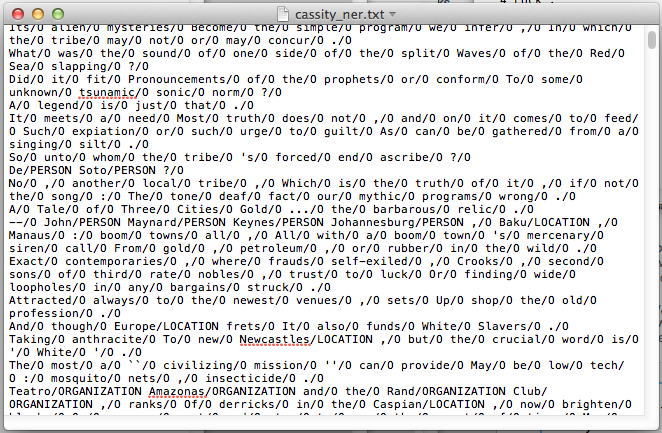 The NER script appends a label to each word in the file. Words detected as names of a person, location, or organization are labeled, respectively, /PERSON, /LOCATION, /ORGANIZATION, and all of the other words get an /O. 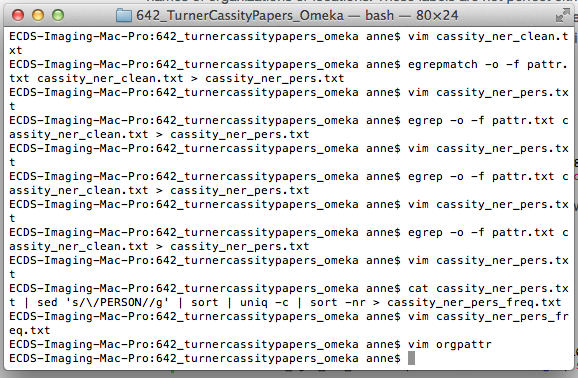 Text file with NER labels. Note that in lines 2-3 the script didn’t catch Red Sea as a /LOCATION. Organization: Artemis (actually a personal name…organization seems to be the trickiest designation to determine, because the list is the most confused of the three). The first actual organization to appear on the list is Teatro Amazonas. Turner Cassity was a poet and librarian who was born and buried in Mississippi; he lived for much of his life in Georgia, and worked as a librarian at Emory; he also traveled and lived outside of the continental U.S. for significant periods of his life. I plan to use text analysis to explore his the places he writes about in poetry. Critics often comment on Cassity’s relationship with place. Cassity is very much a world-wandering poet, a globetrotter, and although the places that he responds to have something in common (mostly, for instance, they are post-colonial places), still the sheer irreducible variety of visitable places and climates is something brought powerfully home to us as we read Cassity. [Cassity’s] poem “Cartography is an Inexact Science” accentuates his idea of the syndication of culture, suggesting that geography is defined more by people’s interrelationships and less by space. If cartography is an inexact science, the extraction of place names from poetry and geolocating them on a map is certainly even more inexact. I look forward to this roundabout exploration of Cassity’s work. A resource for learning the command line: Zed A. Shaw’s Command Line Crash Course.